These Guidelines set out how the ACCC currently proposes to interpret s. 46 and describe the general approach the ACCC will take in investigating alleged contraventions of s. 46. They include a number of practical examples of the types of conduct that in the ACCC’s view will be likely or unlikely to contravene s. 46. Section 46 of the Competition and Consumer Act 2010 (CCA) was revised effective from 6 November 2017. Section 46 now prohibits a firm with a substantial degree of market power from engaging in conduct that has the purpose, effect or likely effect of substantially lessening competition in a market. 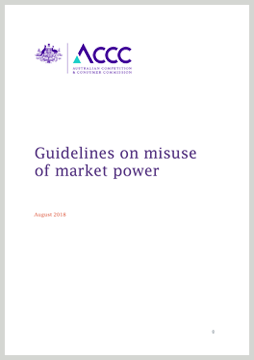 The ACCC is responsible for investigating and enforcing the competition provisions of the CCA, including s. 46. This includes the power to bring court proceedings seeking to prove that the CCA has been contravened. Businesses may also be subject to action by private parties for contraventions of s. 46.